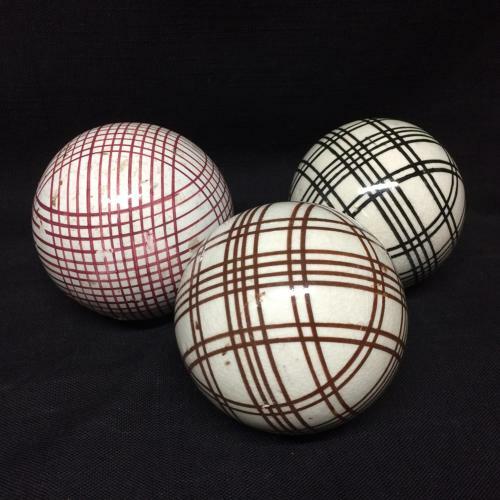 This is a rare set of genuine Victorian Carpet Balls or Carpet Bowls as they were known in Scotland. The large sized ceramic balls each measure approx. 3” in diameter, heavy duty solid glazed and decorated ironstone. The set includes one brown, one black, and one red striped decorated balls. The condition is very good. The brown and black are great and the red has one area of glaze paint loss. A glorious example of the finest in English folk art, and amazing Stocking Stuffers to add to any collection of early sporting goods or early English ceramics.